Sri Lanka is one of many countries to show high growth, but the path to prosperity is not an easy one. Although Sri Lanka liberalized its economy in the late 1970s, ahead of many other developing countries, it has been struggling with low economic growth for decades. No single component is dragging its economic growth, but ethnic conflict is one of the major factors that oppress the economy. Economic growth caught up in 1989-1992, following the introduction of a programme sponsored by the International Monetary Fund (IMF), but slumped soon after the Peoples Alliance (PA) came to power in 1994. After the bitter experience of an economic slump in 1996, growth started to catch up again and significant progress was made as a result of deregulation and liberalization. This trend has been hampered again in the last few years. This study conducts an in-depth analysis of the relationship between nutrition intake and economic growth in Sri Lanka. Although the study was carried out in one country, its authors firmly believe that wider policy implications can be extracted from analysis of Sri Lankas experiences. Moreover, the quantitative methods applied in the study are of use to researchers who are examining development issues in the context of economic growth. In this study, the relationship between nutrition intake and economic growth is estimated. The main focus is on investigating the dual causality of nutrition intake and economic growth. By applying vector autoregressions (VARs), the authors seek the autoregressive dimensions of the hypothesis that better nutrition accelerates economic growth while higher growth increases the nutrition intake. In later chapters, the study establishes the theoretical and empirical models that fit the actual observations and data. Utilizing these estimators, the authors identify the time lag between changes in protein intake and economic growth, as well as between economic growth and changes in protein intake. How great is the cost of hunger in terms of economic growth? How many years does it take to register a positive impact on economic growth after a country has experienced an increase in dietary energy supply (DES)? How many years does it take to register a positive impact on nutrition intake after a country has experienced an increase in economic growth? What are the interactions between increase in nutrition intake and economic growth? What are the implications for achieving the twin goals of poverty reduction and hunger reduction by 2015? This study consists of five sections. First, an overview of Sri Lankas economic profile is given followed by a brief history of Sri Lanka and describes the nutritional and economic issues. The next section introduces the theoretical background to the study, followed by a presentation of specific functional forms and empirical models. The empirical results are then reviewed, followed by the summary and conclusions. The annex discusses the theoretical issues for time-series analysis in greater depth. Sri Lanka covers an area of 65 610 km2, which is about the size of West Virginia in the United States. In mid-2001 the estimated population was 18.73 million. The capital city is Colombo, which has an estimated population of 2.2 million. Parliament is located in Sri Jayewardenepura-Kotte, which is the officially designated capital and the administrative centre. Table 1 shows the populations of other major cities in Sri Lanka. Ethnically, Buddhist Sinhalese make up about 80 percent of the population and are concentrated in the more densely populated southwest. Another 7 percent are Jaffna-based Tamils, who tend to live in the north and east; the up-country or Indian Tamils make up another distinct ethnic group in south-central Sri Lanka. They represent about 5 to 6 percent of the population and work on plantations. The rest of the population are Tamil Muslims, who account for 7 percent of the total and are mainly traders living in the eastern province (EIU, 2002). In the sixteenth century, Portuguese traders started to seize the islands coastal areas. By the mid-seventeenth century, the Netherlands had replaced Portugal in the dominant position, and the Netherlands jurisdictional system has been an important legal basis since then. At the end of the eighteenth century, the United Kingdom took over from the Netherlands, defeating the last native ruler, the King of Kandy, in the early nineteenth century, when the Crown Colony of Ceylon was established. Under United Kingdom colonization, Ceylon was an important producer of tea, rubber and coconuts. Ceylon became a fully independent state on 4 February 1948. Since independence, it has been pro-democratic. Two major parties have ruled the country: the United National Party (UNP) and the Sri Lanka Freedom Party (SLFP). UNP draws most of its support from the educated and westernized urban areas. Many business leaders also support UNP. On the other hand, SLFP inclines to the left and socialistic policies. UNP ruled from 1948 to 1956, and SLFP from 1956 to 1965 (with a short interruption when UNP came to power from March to May 1960). UNP returned to power in 1965. In 1971, radical, young followers of Marxism, the Janatha Vimukthi Peramuna (JVP, or Peoples Liberation Front) emerged, and their rebel activities virtually paralysed the whole economy. The SLFP government suppressed the rebels and declared a state of emergency for the following six years. In 1977, UNP returned to power with a historical victory in Sri Lankan parliamentary elections. The Tamil group, representing the Indian Tamils of the central region, joined the UNP government. The newly elected government reformed the political system on the basis of both United States and French models. The main feature of this reform was the creation of the presidency. The UNP government narrowly defeated SLFPs candidate in the 1988 presidential elections and, after one year, UNP won an absolute majority in the parliamentary elections. During 1987 and 1989, Sri Lanka experienced another round of violence provoked by JVP. Thousands of young people lost their lives to unofficial vigilante groups and the security forces. The capture and execution of JVPs leaders brought an end to the violence. Sri Lanka suffers from ethnic-based civil war. Conflict started in 1956 when the newly elected Sinhalese-dominated government introduced Sinhalese as the official language. Antagonism between the Sinhalese and the Tamils grew during the 1960s and 1970s with the Tamils demanding an independent state, Eelam, and creating terrorist groups to bring this about. Tension between the two ethnic groups broke out in the huge riot of 1983, after which Tamil refugees fled the country. In July 1987, India and Sri Lanka signed a peace accord, which ensures greater autonomy for the Tamils and disarmament of the rebels through deployment of the Indian Peace Keeping Force (IPKF). This provided the opportunity for Sri Lankas northern and eastern provinces to be merged, with more self-ruling power for the Tamil community. The Liberation Tigers of Tamil Eelam (LTTE or Tamil Tigers) rejected the accord; hence, IPKF was deployed against LTTE, which resumed the use of guerrilla warfare. JVP also opposed the agreement and started rebel activities against the government. UNPs leader, Ranasinghe Premadasa, was elected in 1988 and openly criticized this peace accord, demanding direct negotiations with LTTE. Reflecting this decision, IPKF withdrew from the northern states of Sri Lanka, thereby returning them to LTTE control. While the government and LTTE were engaged in peace talks, LTTE was able to control other political groups. Negotiations with LTTE continued throughout the first half of the 1990s, but UNPs political fortune came to an end on 1 May 1993, when Mr Premadasa was assassinated in a suicide bomb attack. UNP lost the 1994 general election to the Peoples Alliance (PA) coalition, which governed Sri Lanka from 1994 to 2001. There is armed ethnic conflict between LTTE and the government. Currently, the Norwegian Government is mediating for both parties, but the long conflict continues to hamper macroeconomic stability and reduce growth potential. In addition, the burden of military expenses makes it very difficult to invest in public infrastructure. Terrorism is a threat for private business and involves significant security costs. Civil unrest is not uncommon before and after elections. Violent crime is on the increase as a result of the long armed conflict, which makes it easier to obtain weapons. LTTE funds drug smuggling and organized crime, thereby introducing civil unrest into society. Since independence in 1948, Sri Lanka has undergone a series of changes in economic polices resulting in several structural changes in the economy. These policy changes include three significant phases, which coincide with changes in political power. Under its first government (1948 to 1956), UNP accelerated market-oriented strategies. In 1956, with the adoption of left-wing political ideology, the SLFP government selected an import-substitution industrial strategy, which was accomplished through tariff protection. In addition, the restructuring process involved building a state monopoly called the Nationalization Programme. Because nationalization and inward-looking strategies had been welcomed by the majority of the nation, the UNP government of 1965 to 1970 did not attempt to change the import-substitution economic strategies. In spite of a mild attempt at liberalization in 1968-1969, the second phase of the import-substitution policy continued until 1977. In 1977, when UNP was re-elected to government it introduced the third phase of economic policy change, which was directed at creating a free market environment mainly to attract foreign investment. These policy reforms led to higher economic growth. When SLFP returned to government in 1994, it remained committed to liberalization and promoted the liberalization of the economy and some high-profile privatizations (Athukorala and Rajapatirana, 2000). During the study period 1961 to 2000, the gross domestic product (GDP) at constant 1995 prices increased from SL Rs 151 642 million in 1961 to Rs 857 035 million in 2000. 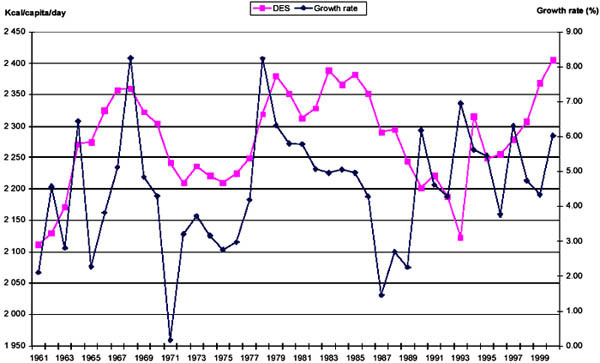 Figure 1 plots both the GDP growth rate and DES. 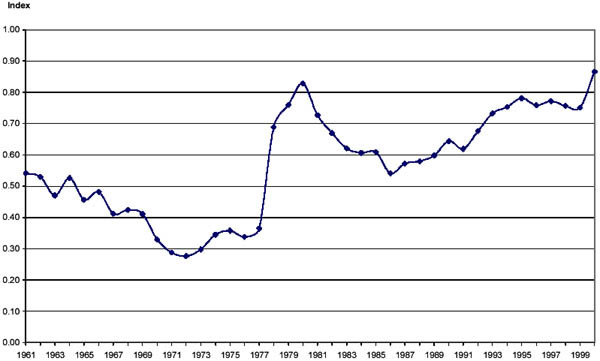 As the figure shows, significant peaks in growth occurred in 1968 and 1978 (both with 8.2 percent growth). The peak in 1968 coincided with a mild attempt to introduce liberalization polices. The surge of GDP growth in 1978 is attributed to the liberalization polices introduced by the newly elected government (UNP) in July 1977. Coincidentally, the movements of the GDP growth rate and of DES show some similarities; this is partial evidence of dual-causality between economic growth and nutrition intake. The highest peak of DES occurred in 2000, when it reached an average of 2 405 kcal per capita per day. 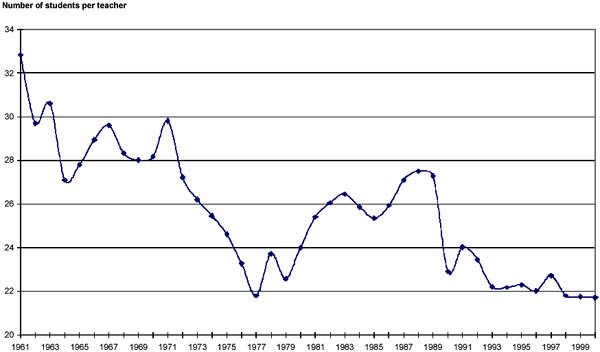 The GDP growth rate dropped sharply in 1971 and in the 1987 to 1989 period. These shocks are attributed to rebel insurgencies launched by JVP, which were in addition to the ethnic civil war in the northern part of the country, as described in the previous section. Furthermore, during the 1972 to 1976 period, the reported economic growth rates ranged from 3.2 percent to 3.6 percent, which are well below the average annual growth rate. This is attributed to the two oil shocks and the tied economic polices adopted by the SLFP government during 1970 to 1977. State-led development ideology came to a peak between 1971 and mid-1977. The gradual slowdown of GDP growth during the 1980s is attributed to the ethnic war in the northern part of the country, which affected the flow of foreign direct investment. Sources:Central Bank of Sri Lanka and FAO, various issues. During this period, the service and manufacturing sectors grew rapidly while agriculture grew comparatively slowly. From independence until the mid-1980s, the agriculture sector played a central role in the economy. Its contribution was based on three main plantation crops - tea, rubber and coconut - inherited from colonial rule. Since 1977, the dominance of agriculture has gradually disappeared, and the manufacturing sector has emerged as a major contributor to the whole economy, shifting power from the agriculture to the industrial sector. However, this trend changed as a result of a changed investment trend at the end of the last decade. Source: Central Bank of Sri Lanka, various issues. Note: The openness index is calculated by the sum of exports and imports as a ratio of GDP. Although GDP increased during the study period, there were significant fluctuations in economic growth. These were owing to several causes, including changes in economic policy, which had considerable positive effects on GDP. Figure 2 shows the openness measure, calculated as the sum of exports and imports as a ratio of GDP. As the figure shows, the level of openness changed significantly after the late 1970s. The first phase of trade policy was characterized by inward-looking economic strategies, which then gave way to free market economic strategies. This structural change had a significant influence on economic performance; hence, this policy change is considered for the empirical model. The investment trend shows the status of physical capital formulation, which coincides with the structural change in economic policies during this period, i.e. a shift from inward- to outward-looking strategies. From the point of view of endogenous growth theory, skill and knowledge (which refer to the quality of human capital) are more important factors in enhancing economic growth than quantity is. According to several authors (Kiker, 1966; Hornbeck, 1991; OEDC, 1998), human capital consists of tangible assets that have the capacity to enhance or support productivity, innovation and employability. That is, the augmentation of education, nutrition, health and migration can lead to improvements in the quality and managerial skills of human labour, i.e. human capital. In the literature, nutrition, health and education are the commonly identified factors related to human capital. Since independence in 1948, the Sri Lankan Government has paid special attention to basic needs-oriented development strategies, i.e. human capital formation through education, health and the nations nutritional needs (Isenman, 1980; Hess and Ross 1997). Under the Sri Lankan welfare system, everyone is eligible for both free education and free health facilities. Before 1977, nutrition policies were mainly in the form of food ration schemes for all citizens, which were initiated during the Second World War. The expenditure share of rationing became a heavy burden to the economy, and varied between 8 percent and 17 percent of GDP. In 1977, the newly elected government abandoned the ration programme and replaced it with the alternative food stamp programme, which covered only about half of the population (Edirisinghe, 1987). This programme was abolished in 1987 with the introduction of a direct income package called Janasaviya (peoples power) for a target group of the population. As in most developing countries, data on daily energy and protein intake are not available for Sri Lanka; therefore, data on the availability of energy and protein are considered proxies for the nutritional status of the country. 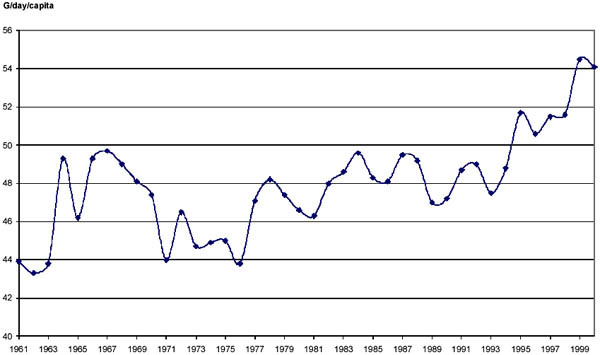 Figure 1 shows the pattern of DES during 1961 to 2000. As the figure shows, during this period DES increased from 2 274 kcal in 1965 to 2 405 kcal in 2000. There were considerable fluctuations during the study period. A significant drop in calorie availability occurred during 1971 to 1977, coinciding with the tied economic policies adopted during this period and the oil shock on the world market. As shown in Figure 3, per capita daily protein intake increased from 46.2.g in 1961 to 54.1 g in 2000. Reductions during 1970 to 1977 are attributed to the adoption of more inward economic policies and oil shocks in the world market. Compared with the pattern of DES, there was less fluctuation in protein availability during the study period. This study uses the student-teacher ratio as a proxy for the quality of education, which in turn represents the quality of human capital. Figure 4 presents the student-teacher ratio during the period. There were some fluctuations over the years, but overall there has been a significant decrease in the number of students allocated to each teacher over the study period. In 1961, there are 32.8 students per teacher; this figure declined to 21.7 students per teacher in 2000, which is the lowest in the study period. The changes in the pattern of student-teacher ratios were due to changes in student enrolments and changes in policies for teacher recruitment. The sharp drops during 1977 and 1990 were caused by the new teacher recruitment programmes that were introduced by newly elected governments. Not only in Sri Lanka but also in developing countries in general, education is a major determinant in the development of human capital. During the study period, despite volatility, educational performance improved significantly. Political interest in education is the key factor for achieving good performance in education. By 1999, nearly all children in the relevant age group were enrolled in primary education. As there are sufficient reasons to believe that Sri Lankan human capital development depends mainly on achievements in the education sector, the student-teacher ratio is one of the best proxy indicators for the quality of human capital. Since independence, economic performance has depended on changes in economic polices. During 1961 to 2000, the average annual economic growth rate was about 4.5 percent. Until 1977, Sri Lanka adopted an inward-looking, import-substitution industrial strategy. During this period, the economy showed relatively low growth. By the end of the 1970s, the economy was performing well with the introduction of liberalization policies. Sri Lankan economic performance is also affected by another complex sets of factors, such as the sudden youth uprising, ethnic war and world oil price shocks, in addition to the inward-looking economic policies pursued by several governments. During the youth uprising and ethnic war, economic growth and investment flows dropped significantly. The government spends more on education than on the health sector. As a result, education is the most important sector for human capital development and, owing to this relative importance, this study uses the student-teacher ratio. Solow (1956) is one of the pioneers of growth modelling, and his model is considered the foundation of all neo-classical growth models. Assuming that a market is perfectly competitive, Solow set up the Cobb-Douglas production function, which has the characteristic of constant returns to scale. Capital and labour, which are the only inputs, are paid their marginal products. Decreasing returns to capital are assumed because of the scarcity of land (fixed input). Solow explained that the steady-state level exogenously depends on given rates of saving, population growth and technological progress. Growth rate depends on population growth and technological progress. In Solows setting, both output and capital stock must grow faster than employment in order to achieve long-run growth. In addition, there should be an exogenous technological improvement because the steady-state behaviour itself cannot explain long-run growth. Solow identified two possibilities for increasing productivity: technological progress and increasing returns to scale. He used technological progress to explain long-run growth for two main reasons: 1) technological growth seems to be a reasonable explanatory variable for long-run growth in North American; and 2) the exogenous shock is essential to achieving a steady state, owing to the assumption of constant returns to scale. In order to overcome the shortcomings of the Solow model, some researchers extended the exogenous growth model. These new models are called endogenous growth models. Many endogenous growth models change the simple consumption function in the Solow model into an explicit theory of household behaviour concerning consumer preferences (Mankiw, 1997). In general, endogenous models explain that the rate of investment and the rate of return to capital might increase (rather than decrease) with increases in the capital stock. In this context, long-run growth is driven primarily by the accumulation of knowledge: a forward-looking profit-maximizing agent focuses on knowledge as the basic form of capital. In the endogenous growth setting, knowledge or expertise is treated as a positive externality, which provides the cause of long-run growth. The endogenous growth model assumes constant returns to capital, which deviates from Solows assumption of diminishing returns to capital. In addition, the growth rate of output is identical to the growth rate of per capita capital, which is determined endogenously. Hence, when the growth rate of output is being examined it is necessary to investigate the determinants of the growth rate of capital. This growth rate of capital, in turn, depends on the per capita investment, the population growth rate and the capital depreciation rate. According to Solow, the savings rate, population growth rate and technological growth rate are exogenously determined. In a typical endogenous growth setting, a higher savings rate generates a higher output growth rate, while a higher population growth rate and a higher depreciation rate of capital reduce the growth rate. In sum, the growth rate of the economy does not exogenously depend on technology, but is endogenously related to the savings rate, the population growth rate and the rate of capital depreciation. Some researchers claim that constant returns to scale on capital are a serious drawback of the model, especially from the perspective of microeconomic theory. When increasing returns are introduced to all factors, the model becomes unsuitable for an aggregate setting, such as explaining a whole countrys economic growth. Increasing returns to all factors means that the larger the firm the more efficient it is. Thus, a single firm comes to dominate the whole economy. In addition, aggregate models create a situation where the rate of growth of per capita output is a monotonically increasing function of the rate of growth of the population. If this were the case, the model implies that the higher the rate of population growth, the faster the economy grows. In order to make the endogenous growth model fit a country, a concept of external benefit can be introduced. Private returns to individual firms exhibit constant returns to all factors; however, there are benefits to society that are external to the firm. In this setting, such social returns exhibit increasing returns to scale from societys point of view; hence, an industry or household provides external benefit to society in the endogenous growth model. Because human capital is very difficult to define, several different definitions have been provided. All of these refer to a common aspect that is related to peoples capacity to perform tasks effectively. According to these definitions, human capital consists of intangible assets that have the capacity to enhance or support productivity, innovation and employability. The key factors for human capital formation are nutrition, health and education. Human capital plays a central role in improving labour productivity and stimulating entrepreneurial activity, leading to improved welfare for the whole society owing to the positive externalities. This leads to a nations growth and development. Although it is difficult to find a precise measure, human capital plays an important role in economic growth and development. Growth accounting is of interest to many of the researchers who are trying to understand the mechanism of economic growth. As already mentioned, in the literature there are two prominent growth models: neo-classical and endogenous. Fundamental differences between these two models depend on justifying the status of technology and capital. The Solow (neo-classical) growth model concerns the constant returns to scale production function, assuming decreasing returns to capital and exogenously given technology. In this context, long-run growth relies solely on technological progress. In contrast, the endogenous growth model assumes constant returns to capital with increasing returns to all production inputs, and technology has no role in long-run growth. Capital is the key factor to achieving long-run growth. Furthermore, the endogenous growth model explains the importance of human capital in economic growth. In general, empirical findings show that the neo-classical growth model is more useful for explaining the economic growth of developed nations, while the endogenous growth model is more suitable for developing nations. Ganegodage (2001) investigates human capitals contribution to economic growth in Sri Lanka. The impact of human capital is measured in terms of two variables: 1) a quantity measure based on secondary school-level education; and 2) a quality measure based on the student-teacher ratio. Ganegodage applies the concept of cointegration for these variables by utilizing the methodological framework developed by Lau and Sin (1997). The estimated elasticity from the regression results indicate that a 1 percent increase in the number of secondary school students would add 0.23 percentage points to the GDP growth rate. The student-teacher ratio has a higher return on the GDP growth rate; a 1 percent increase of the ratio coincides with a 0.43 percent increase in GDP. These results show the importance of educational attainment for economic growth. Benhabib and Spiegel (1994) combine the concept of human capital (educational attainment) and the endogenous growth model to investigate whether the economy can achieve higher growth through having a more educated labour force, probably owing to more rapid adaptation of new technology. By utilizing cross-country data, the authors conduct growth accounting with human capital as a factor of production. Results from the standard augmented Solow model indicate that the role of education in growth accounting is minimal. The authors derive an alternative model in which the levels of human capital stocks influence per capita income growth through growth rates and catch-up factors, which can be interpreted as the speed of adoption of technology from abroad. This catch-up factor is robust across the model, which implies that the accumulation of human capital accelerates the adoption of domestic and foreign technology, which in turn accelerates economic growth. Nelson and Phelps (1966) suggest that the simple addition of an index of education or human capital as an input would lead to misspecification of the model. Instead, higher education can be interpreted as facilitating more rapid adaptation of new technology. Cho and Graham (1996) find that poor countries actually converge from high capital to an effective labour ratio and to low steady states, which contradicts the common conjecture that lower-income countries converge to higher steady states. Their empirical results justify this hypothesis and contradict the neoclassical growth model. Doucouliagos and Doucouliagos (1997) test the existence of Granger causality between human capital accumulation and economic growth in the United States. The optimal lag length is determined on the basis of the Akaike and Schwarz criteria. The results from the error correction model fitted with the long-run parameters by the canonical cointegration regression show that, in general, human capital indicators do have a causal influence on growth rate. The model indicates that school enrolments of grades one to eight do not contribute directly to outputs, but do contribute to GDP later on. Tallman and Wang (1994) maintain that human capital is the engine of growth and that human capital accumulation is largely affected by government policies, the improvement of financial markets and the opening of international trade. Empirical results support the view that educational attainment, as a proxy for human capital accumulation, enhances overall production. Utilizing the Cobb-Douglas production function, the results do not reject the constant returns to scale hypothesis. Quality-adjusted measures of labour are more readily comparable than raw labour inputs are. Overall results support the view that Taiwanese economic success is largely explained by high school attainment, which is a proxy for human capital accumulation. Cheng and Hsu (1997) apply various causality tests to the relationship between GDP and human capital measures in Japan. In their study, the number of college graduates divided by the total labour force is used as a proxy for human capital per worker. Granger tests reveal the bi-directional causality between the human capital measure and economic growth in Japan. Investment in human capital and economic growth reinforce each other. A study by Goetz and Hu (1996) has a twofold aim: the bi-directional relationship between economic growth and the growth in educational attainment. These are empirically tested, and the results indicate the convergence effects of the stock of human capital. Educational attainment, measured in terms of the percentage of the population of 25 years or older in 1980 to have a high school or higher degree, is used as a proxy for human capital stock. County-level data from the southern United States are utilized. Empirical results show that there is a simultaneous relationship between economic growth and educational attainment. In addition, regions with higher educational attainment show slower growth in human capital, which implies convergence effects in educational attainment. The initial income level affects both economic growth and human capital growth positively. Hamilton and Monteagudo (1998) address the question of what makes some countries rich and how much difference a policy would make, and seek a solution for the classical Solow model in which human capital investment is augmented. Annual data are taken from the Penn World Table. The ordinary least square (OLS) regression of the change in growth rate and the change in the share of output devoted to investment indicates a positive relationship, while the simple OLS regression results between growth rate and investment in education show a negative relationship. The authors replace the educational investment variables with other variables in different periods to allow for the time it takes for educational investment to influence GDP growth; however, education has a negative effect on growth. They conclude that the hypothesis that countries can significantly improve their growth by increasing investment in public education is not supported by the available data. Recent cross-country regression models found no relationship between economic growth and increased educational attainment, which contradicts a great deal of the micro-econometric evidence. Temple (1999) maintains that unrepresentative observations hide the true relationship between economic growth and human capital accumulation in cross-country growth accounting; in particular, the indicator for human capital may differ considerably among countries. Since OLS estimation results tend to be dragged by the outliers, Temple suggests applying for least trimmed squares. By successively dropping the observations that indicate a high residual, the log difference of human capital becomes significant at the 1 percent level. The author shows that a small number of countries showing little or no effect on economic growth dominate the simple cross-country regressions owing to their high residuals. By controlling those observations, education does indeed show positive and significant effects on economic growth. Nonneman and Vanhoudt (1996) suggest that the endogenous accumulation of technological expertise will be further augmented in the Solow model for Organisation of Economic Co-operation and Development (OECD) country samples. Expertise is entered in the production function in the same way as the other primary factor inputs are. From the fully augmented regression results (physical and human capital and expertise), three-quarters of the variations in per capita income among OECD countries can be explained. By relaxing the assumption that these countries are close to a steady-state growth path, the authors find that the influence of human capital is less important among OECD countries. Jones (2001) addresses the question as to why economic growth is not explained by educational attainment, even though ample micro-econometric examples show the relationship between education and productivity. The author hypothesizes that a workers education level and wage earning are highly correlated; on the other hand, education level and productivity are not. Based on this hypothesis, the author addresses the relationship among the education level, wage earning and productivity of workers in Ghana. Utilizing the logarithmic form of the Cobb-Douglas with an additive error, Jones finds that an increase of one year in the average level of education is associated with a rise of about 7 percent in productivity. From regression analysis, primary and secondary school education do not affect productivity, while vocational and polytechnic training and university education have significant effects. In addition, the empirical results indicate that firms pay higher wages to more productive workers. A large body of literature shows that the endogenous growth model fits many cases in developing countries better than the neo-classical model does. This study utilizes the concept of endogenous growth theory in the empirical model. In addition, it broadens the proxy of human capital to include nutrition intake, i.e. it hypothesizes that the higher the nutrition intake, the better the human capital of labour. In addition, labourers with better nutrition are less likely to become ill and can also learn more quickly. This in turn leads to higher economic growth. The next chapter introduces a more specific theoretical background to this study. One of the main objectives of this study is to find out whether nutrition intake has any long-run effect on economic performance. Moreover, it is natural to consider the duality of the problem, i.e. nutrition intake will affect economic performance while, at the same time, economic performance will affect nutrition intake. However, these two effects may have different dynamics. In addition, the study aims to identify both the long-run relations and the short-run dynamics. Both qualitative and quantitative estimates are expected from the empirical models. student-teacher ratio (average number of students per teacher). Apart from the protein series, all the series are from the Central Bank of Sri Lanka. Because data on physical capital stock are not available for the reference time period, this stock is calculated by using the perpetual inventory method. The protein series is extracted from FAOSTAT, an online statistical data set maintained by FAO. The natural logarithm form of this series is applied. Sample statistics are reported in Table 2. Notes: Real GDP per capita and real capital per capita are in real Sri Lanka rupees (base year = 1996); annual protein intake per capita is in grams. In all cases the number of observation is 36 (1965-2000). The longest time series that can be obtained for protein is 36 years, which is rather short in terms of the common standard of time series tests. If more variables are included, the number of coefficients increases rapidly. As a result, a lack of degree of freedom reduces the significance of the tests results. After dozens of experiments, the five variables listed were selected. Such a choice of variables does not omit important explanatory variables and, at the same time, it is capable of identifying the relationship that the study investigates. Equation 1 is the no constant, no trend case; Equation 2 is the constant, no trend case; and Equation 3 is the constant and trend case. If the test statistic is less than the corresponding critical value (in absolute terms), the null hypothesis of a unit root in the original time series is not rejected. where; Gi = -I + P1 + P2 +... + Pi; i = 1, 2, 3,..., p-1; and P = ab'. Z is an n by 1 vector of I(1) potentially endogenous variables; and DZ is the first-difference vector. The first term on the right-hand side, i.e. , is the first-difference VAR term, where G is the n by n matrix of estimated coefficients; and p is the order of VAR. This term captures how current changes depend on previous changes in vector Z. The second term on the right-hand side, i.e. PZt-p, represents possible cointegration relations between variables in vector Z. The coefficient matrix P can be decomposed further into the product of two matrices, denoted by ab', where a and b are k by r matrices of adjustment coefficients; a is the vector of speed of adjustment parameters that accounts for adjusting the deviation to the long-run equilibrium; and b is the normalized coefficient vector, i.e. the cointegrating vector, which indicates the long-run relationship. D is an n by 1 vector of I(0) exogenous dummy variables; mt stands for I(0) exogenous variables; and m is an n by 1 vector of constant terms. Finally, e is an n by 1 vector of white noise. Empirical procedures are carried out in the following steps. First, annual data from 1965 to 2000 are obtained for the five time series. Second, each series is subjected to a set of unit root tests. After using unit root tests to confirm that each series is a I(1) process, Johansen maximum likelihood procedures are used to test for cointegration and to estimate error correction parameters. The technical aspects of the Johansen procedure are described in detail in the Annex. The long-term effects of the variables in question can be represented by the estimated cointegration vector, b; however, the impulse response functions have to be relied on to reveal the short-term dynamics. The pair-wise response dynamics between these variables can be plotted with the estimated coefficient matrices and the error variance-covariance matrix. This study is particularly interested in the long-term effect of protein intake on economic performance, and the short-term dynamics towards the new steady state after an exogenous shock to protein intake. In addition, it is also interested in the mirror image of how economic performance affects protein intake, in both the long and the short terms. In summary, the estimated cointegration vector will answer the question of the long-term relation, while the plotted impulse response functions will answer the question of the short-term dynamics. Impulse response functions reveal the short-run dynamics. These functions show the responses to Cholesky one standard deviation (SD) innovations to the variables in question. The results are described below. The previous section gave a brief description of the procedure for the unit root test and the concept of cointegration. Table 3 reports the unit root tests results for each of the variables used in the study. The augmented Dickey-Fuller test, the Phillips-Perron test and the Perron test are adopted. For GDP, the protein intake, the openness index and the student-teacher ratio, both the augmented Dickey-Fuller and the Phillips-Perron tests indicate the existence of unit roots. As a structure break is detected for capital, the Perron test is used for that variable. It too indicates the existence of a unit root. Notes: Variables are all in natural logarithmic terms. N lags represents the number of lags included. See Equations A.7 and A.8. Size of the test is equal to 10 percent. Protein intake is a key variable, so it certainly warrants more attention. For nutrition-related data sets, DES and protein intake data were prepared from both FAOSTAT and the Central Bank of Sri Lanka: 1) DES data come from FAOSTAT; 2) protein intake from FAOSTAT; 3) DES from the Central Bank of Sri Lanka; and 4) protein intake from the Central Bank of Sri Lanka. DES is denoted as kilocalories per capita per annum, while protein intake is grams per capita per day. For this study, protein intake would seem to be a better representation of the notion of nutrition intake, and affects economic growth in the case of Sri Lanka. The unit root test score confirms this conclusion; unit root tests can only identify protein intake from FAOSTAT to be I(1). The other three series used produce either clear rejections or ambiguous results, and were thus dropped in consideration of the low power of most unit root tests. As a result, the protein intake data from FAOSTAT is adopted in the estimation. It is less controversial for GDP and capital series to show unit roots; on the other hand, it is not clear that protein, openness and the student-teacher ratio have unit roots, especially in developed countries. In general, protein intake may have a bliss point at which an average person cannot consume any more. For most countries, the measure of openness can also be bounded. In the long run, the student-teacher ratio will not vary outside specific boundaries. In the case of Sri Lanka, all three variables passed the unit root test. This fact can be interpreted as reflecting a certain stage of economic development at which protein intake is still far from reaching the bliss point, the openness measure changes randomly according to government policy regime changes and the student-teacher ratio generally decreases as the country improves the education quality at the margin. As a result, for a developing country, it might not be uncommon to observe this feature of unit roots. In 1977, Sri Lanka became the first country in South Asia to adopt liberalization policies, but open economic policies were not implemented properly. As a result, openness was affected only temporally. After four years of the open economic policy, the openness index returned to its previous trend. This would be the main reason why no structural break was detected for the openness index, and it showed I(1) process. Following the steps of the Johansen procedure, hypothesis testing procedures were carried out to select the order of VAR, starting with a maximum lag length of four. A lag length of more than four is not considered because of the limited sample size. If the residuals do not suffer from serial correlation, it is appropriate to select a lower lag length. Although incorporating additional coefficients will increase the fit of the model, it will also reduce the degree of freedom. Results from the lag length test suggest that the possible lag lengths lie between one and four. Although a shorter lag length is preferred, there is no practical basis for considering order one for an error correction model, because to do so would directly imply that there is no short-run dynamic part in the model after fixing the long-run behaviour. Thus, the analysis is restricted to order two. The rank of the cointegration, i.e. the number of cointegrating vectors, is selected by using the trace test and the maximum eigenvalue test. Although these test results indicate that there is more than one cointegrating vector, analysis was performed using only one cointegrating vector to reduce the number of coefficients to be estimated. Table 4 reports the maximum likelihood estimation results with the Johansen procedure. For reasons explained in the previous section, the focus is on order two to estimate the error correction model (ECM) to maintain parsimonious behaviour, and rank one on the cointegrating vector to focus on the relationship between nutrition and economic growth. This study adopts the concept of endogenous growth theory, so the time trend is not considered in the estimation. The time trend represents the exogenously determined technological innovation, which is the central cause of economic growth in Solow-type exogenous growth models. First, the model with constant term inside the cointegrating vector is selected. The estimated coefficient for the constant term is not significant; therefore, the vector without the constant term is estimated. The order of variables is: GDP, capital, protein, openness and student-teacher ratio. The coefficient of protein is of major interest. This is 0.49, which is significant at the 1 percent level. Such magnitude implies that a 1 percent increase in protein intake will increase GDP by 0.49 percent in the long run. Evaluated at the sample mean, a 1 percent increase in protein is about 176 g per capita per year, and a 0.49 percent increase in real GDP per capita is about 269 Sri Lanka rupees. Other variables contribute to GDP in an intuitive way. Physical capital has a positive impact on GDP. The estimated coefficient for the physical capital variable is 0.66. Openness also affects GDP positively, with elasticity of 0.11. The student-teacher ratio, which is an inverse of the measure of the quality of human capital, has a positive long-term impact on GDP. The normalization of the cointegrating vector depends on the variable in question, which means that any selected variable can be normalized. In terms of Vector 5, it is irrelevant which variable on the left-hand side is shown to be one. It should be noted that Vector 5 simply describes a long-term relation among the included variables, but does not necessarily imply causality among variables. The same conclusion can be drawn from any re-parameterization and re-normalization. For instance, it can also be claimed that, in the long term, a 1 percent increase in GDP is usually associated with a 2 percent increase in protein intake. Because of this feature of the model, VAR is consistent with the idea of dual effects between GDP and protein intake. In Table 4, the row labelled Matrix A gives the long-term adjustment coefficients. These show the extent to which the current change in vector Z is a response to the last time deviation to converge with the long-term relation. In other words, the figures in this row identify the fraction of the long-term gap that is closed in each period. The first equation, i.e. the GDP equation, shows that the remaining long-term GDP gap closes by about 30 percent in each period, while the gaps in the capital and protein equations close by about 14 and 17 percent, respectively. These results imply that protein and physical capital take longer to achieve equilibrium after a shock. Because of the insignificant results in the preliminary cointegration tests, the two adjustment coefficients of openness and student-teacher ratio are restricted to zero. This indicates that these variables are determined by outside factors such as political decisions. The other coefficients reported in Table 4 are short-run dynamics. These parameters control the short-run dynamics of the changes in vector Z. The short-run dynamics describe how current changes are related to previous changes in vector Z. Because the algebraic representation of these lag-difference responses is complex, it is common practice to show them as impulse response functions, which can demonstrate the short-term dynamics of each variable in vector Z. Note that all short-term changes in vector Z are the combined results of short-term responses from the autoregression (AR) term and long-term cointegration relations. This study reports two sets of impulse response functions: one is for one standard deviation innovation in protein, and the other is for one standard deviation innovation in GDP. The responses of GDP, capital and protein are plotted for both scenarios. Each period corresponds to one year. The upper panel of Figure 5 shows the impact of protein increase by one standard deviation. The solid curve represents GDPs response to protein innovation. According to the set-up of the cointegration relation, the growth rate of GDP is stationary, thus no change will have a growth effect, and may have only a level effect. As a result, GDP will continue to grow at a higher rate than usual for only a short period, and will eventually level off. Following a protein innovation, GDP increases quickly at the beginning, and then gradually slows down. The long-term effect should be consistent with the relation specified in Vector 5. Proteins response to protein innovation is more complicated. After the innovation in protein intake, protein jumps up, reflecting a quick absorption of nutrition intake after the increase. However, it takes a quick dip after the initial surge, and then turns back up and converges to the new steady state. In terms of speed of convergence, protein responds to innovation very quickly. There is no clear explanation as to why there is a quick dip in protein after the initial surge in response to protein innovation. 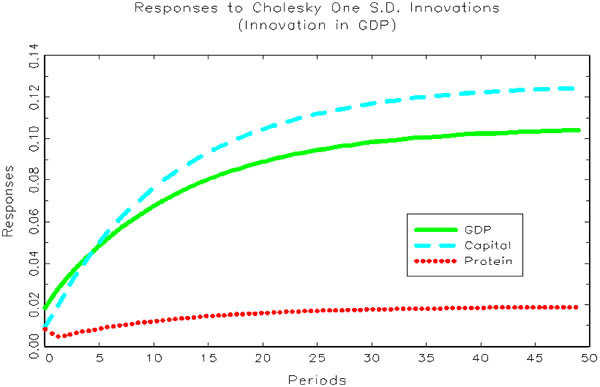 The lower panel of Figure 5 shows the responses of GDP, capital and protein with respect to one standard deviation innovation in GDP. Because of the unit root feature of the model, short-term innovation will have a long-term level effect. A short-term innovation will temporarily push the growth rate up to a higher level, after which it will eventually reduce to its original level. GDP increases by a deceasing rate, which eventually levels off at a higher level. 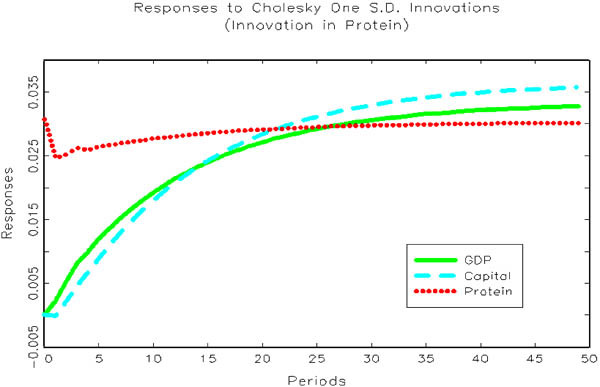 Proteins response to GDP innovation is again more complex than those of other variables. Initially, protein jumps up, but then it takes a quick dip before turning back up and slowly converging to the long-term equilibrium. Figure 5 provides an insight into how quickly GDP responds to protein, and how quickly protein responds to GDP. From a comparison of the dynamics in the two panels, it can obviously be concluded that proteins impact on GDP is quickly absorbed and exhausted, while GDPs impact on protein is slowly absorbed and gradually exhausted. In particular, the half-life of GDPs impact on protein is calculated to be about 14 years, while the half-life of proteins impact on GDP is about eight years. The slow increase in protein after a GDP increase is puzzling. When income increases, protein intake should increase quickly. According to Engles Law, low-income countries devote a larger share of income to food items. Increased food consumption usually coincides with increased protein intake, thus a quick response of protein with respect to income increases should be observed, but the study data do not show this. This result might be explained by the fact that the variation in food intake is far smaller than that of GDP, and the result can be interpreted only in terms of how it relates to other variables. On the other hand, GDP responds to protein innovations relatively quickly. Most literature attributes this effect to two sources. The first source emphasize that better nutrition improves the productivity of the current labour force, thus GDP responds quickly and positively. However, unless the current standard of living is severely below the subsistence level, this effect is not expected to be dominant. The second source looks at the long-term improvement in the quality of human capital, and claims that a better-nourished labour force can accumulate human capital at a faster rate, thus improving the quality of labour force in the long run. The studys results seem to reflect effects from both sources. The most fundamental and important task in the fight against hunger is to identify the relationship between nutrition intake and economic growth. This study on the cost of hunger addresses the following question: What does the presence of hunger cost a country in terms of economic growth? To answer this question, Sri Lanka time series annual data from 1961 to 2000 are used. Real per capita GDP, physical capital, protein intake, the openness index and the student-teacher ratio are investigated. In addition to these variables, an economic policy regime dummy is added as an exogenous variable to account for changes in Sri Lankas political regime. The study uses VAR and the impulse response functions to analyse the data. VAR is used to assess the long-run equilibrium between nutrition intake and economic growth, while impulse response functions are used to reveal the short-run dynamics of these variables. During the first stage of the analysis, all the variables are tested to see whether or not they are I(1) processes. VAR is then estimated by utilizing the vector error correction model (VECM). The results from VAR indicate the long-run equilibrium for the variables. The short-run dynamics are analysed through impulse response functions. The studys first major finding is that a 1 percent increase in protein intake will increase GDP by 0.49 percent in the long run. In other words, on average, an increase of 176 g per capita per year in the protein intake will increase the real per capita GDP by 269 Sri Lanka rupees. The model characteristic allows this result to be interpreted in the following way: a 1 percent increase in real per capita GDP is associated with a 2 percent increase in protein intake in the long run. The half-life of GDPs impact on protein is about 14 years, while the half-life of proteins impact on GDP is about eight years. The impulse response functions reveal the short-run dynamics of the interactions among variables. The results show that GDP responds to protein innovations relatively quickly. This quick response of GDP is attributed to the contemporaneous productivity shock and the improvement of human capital. FAO adopts a twin-track approach in its fight against hunger. The first track addresses the livelihoods of undernourished people. Livelihoods can be interpreted in terms of various asset holdings, including not only physical capital but also human capital and other factors. The second track asks for immediate action to enhance the access to food. This twin-track approach can be interpreted in various ways, one of which is to see it as both a short-run and a long-run strategy. The results from this study on Sri Lanka justify FAOs twin-track approach. The short-run dynamics confirm that GDP responds fairly quickly and positively to an increase in nutrition intake. The long-run equilibrium indicates that an increase in nutrition intake improves a countrys economy in terms of per capita GDP and, at the same time, increased GDP enhances the nutrition intake. In addition, any programme that enhances immediate, as well as long-term, food security will have positive impacts not only on hungry people but also on a countrys overall economic growth. It can be concluded that work on food security is a direct means of helping the poor to escape from hunger and that food security is a direct, as well as an indirect, path to enhancing economic growth. Reflecting exogenous technology, as in the Solow-Swan model, the deterministic trend is excluded. Endogenous growth theory suggests the inclusion of additional variables such as human capital or openness, which are defined as the driving force of economic growth. If the null of exogenous growth is tested against the alternative of endogenous growth (or vice versa) by imposing overidentifying restrictions on the cointegrating vector, the results could offer empirical evidence of convergence or divergence in growth and income across countries. As this study uses the level of GDP instead of the growth rate on the dependent variable, no tests were carried out to establish whether there are any of the growth effects predicted by the traditional endogenous model. Nevertheless, the existence of a level effect does not rule out the possibility of the existence of growth effects. These hypotheses are not implemented under the current framework; instead, the study simply claims that endogenous variables do have a long-run relation and that this relation can be reconciled with both the endogenous and the exogenous models used. Empirical tests for exogenous versus endogenous growth theory will offer an interesting policy option. The Johansen procedure suggests that it is possible for more than one cointegrating vector to exist, and the current study does not completely rule out multiple equilibria in the long run. For instance, Lau and Sin (1997) analysed the growth model on the assumption of a single cointegrating vector of real GDP and capital for Japan, the United Kingdom and the United States; however, no complete evidence for multiple-equilibria was found. If, as well as pursuing the relationship between growth and nutrition, the relationship with nutrition and other components that affect economic growth - such as research and development (R&D) or savings - are also pursued, it is possible to reveal the relationships of nutrition intake and economic growth and to estimate the cost of hunger more accurately. Athukorala, P. & Rajapatirana, S. 2000. Liberalization and industrial transformation: lessons from the Sri Lankan experience. Economic Development and Cultural Change, 48(3): 543-572. Benhabib, J. & Spiegel, M.M. 1994. The role of human capital in economic development: evidence from aggregate cross-country data. Journal of Monetary Economics, 34(2): 143-173. Cheng, B.S. & Hsu, R.C. 1997. Human capital and economic growth in Japan: an application of time series analysis. Applied Economics Letters, 4: 393-395. Cho, D. & Graham, S. 1996. The other side of conditional convergence. Economic Letters, 50: 285-290. Darnell, A.C. 1994. A dictionary of econometrics. Vermont, USA, Edward Elgar. Dickey, D.A. & Fuller, W.A. 1979. Distribution of the estimators for autoregressive time series with unit roots. Journal of American Statistical Association, 74: 427-431. Edirisinghe, N. 1987. The food stamp scheme in Sri Lanka: cost benefits and options for modification. Washington, DC, International Food Policy Research Institute. EIU. 2002. Sri Lanka: country profile 2002. London, UK, Economist Intelligence Unit. Enders, W. 1995. Applied econometric time series. New York, John Wiley. Engle, R.F. & Granger, C.W.J. 1987. Cointegration and error correction: representation, estimation and testing. Econometrica, 55(2): 251-276. Goetz, S. & Hu, D. 1996. Economic growth and human capital accumulation: simultaneity and expanded convergence tests. Economic Letters, 51: 355-362. Granger, C.W.J. 1981. Some properties of time series data and their use in econometric model specification. Journal of Econometrics, 16(1): 121-130. Hamilton, J.D. & Monteagudo, J. 1998. The augmented Solow model and the productivity slowdown. Journal of Monetary Economics, 42: 495-509. Hess, P. & Ross, C. 1997. Economic development: theories evidence and policies. Fort Worth, New York, Dryden Press. Hornbeck, D.W. 1991. Human capital and Americas future: an economic strategy for the 90s. Baltimore, Maryland, USA and London, Johns Hopkins University Press. In, F. & Doucouliagos, C. 1997. Human capital formation and US economic growth: a causality analysis. Applied Economics Letters, 4: 329-331. Isenman, P. 1980. Basic needs: the case of Sri Lanka. World Development, 8(3): 237-258. Johansen, S. 1988. Statistical analysis of cointegration vectors. Journal of Economic Dynamics and Control, 12(2/3): 231-254. Johansen, S. & Juselius, K. 1990. Maximum likelihood estimation and inference on cointegration with application to the demand for money. Oxford Bulletin of Economics and Statistics, 52: 169-209. Kiker B.F. 1966. The historical roots of the concept of human capital. Journal of Political Economy, 74: 481-499. Lau, S.H. & Sin, P.Y. 1997. Observational equivalence and a stochastic cointegration test of the neoclassical and Romers increasing returns models. Economic Modelling, 14: 39-60. Mankiw N.G. 1997. Macroeconomics. Third edition. New York, Worth. Nelson, R. & Phelps, E. 1966. Investment in humans, technological diffusion, and economic growth. American Economic Review: Papers and Proceedings, 61: 69-75. Nonneman, W. & Vanhoudt, P. 1996. A further augmentation of the Solow model and the empirics of economic growth for OECD. Quarterly Journal of Economics, 3: 944-953. OECD. 1998, Human capital investment, an international comparison. Paris. Perron, P. 1989. The great crash, the oil price shock and the unit root hypothesis. Econometrica: 57(6): 1361-1401. Solow, R.M. 1956. A contribution to the theory of economic growth. Quarterly Journal of Economics, 70: 65-94. Tallman, E.W. & Wang, P. 1994. Human capital and endogenous growth. Journal of Monetary Economics, 34: 101-124. Temple, J. 1999. A positive effect of human capital on growth. Economic Letters, 65: 131-134. USDS. 2001. Background Note: Sri Lanka. Washington, DC, Bureau of South Asian Affairs, United States Department of State (USDS). Available at: www.state.gov/r/pa/ei/bgn/5249.htm. White, K.J. 1997. Shazam econometrics computer program version 8 users manual. Vancouver, Canada, McGraw-Hill. K. Renuka Ganegodage is an agriculture economist at Socio Economics and Planning Centre in Sri Lanka. Kiyoshi Taniguchi is a development economist with the Agricultural and Development Economics Division of the FAO. Xiaojun Wang is Assistant Professor of Economics at University of Hawaii. The authors are indebted to Drs Paul Winters and Sumiter Broca for their discussion and inspiration. The authors have sole responsibility for any errors or omissions. This section is largely adapted from three sources: EIU, 2002; USDS, 2001; and Ganegodage, 2001. This DES figure is taken from FAOSTAT at: http://apps.fao.org/default.htm. The average growth rate for the study period is 4.5 percent. The studentteacher ratio represents the number of students per teacher. Hence, the lower the number of students, the better the quality of education. This programme was implemented in 1977 and 1989. More detailed explanations are given in the Annex. See the Annex for a detailed explanation of the steps of the Johansen procedure. Lag length tests are discussed in the Annex. To estimate order three, 25 (five times five) coefficients have to be estimated, in addition to the coefficients estimated using order two. The degree of freedom declines quickly with the order of VAR. Detailed trace test and maximum eigenvalue test results are not reported, but are available from the authors on request. Owing to the functional form, a negative sign in front of the coefficient can be interpreted as positive. As this is the studentteacher ratio, the smaller the number, the better the index of human capital. The growth effect and the level effect are defined as the following: a change in variable has a growth effect only when that change alters the rate of economic growth; if it changes the level only once (such as a one-time jump) but leaves the growth rate constant, it has only a level effect. For example, an increase in savings rate in the conventional Solow model has only a level effect, and no growth effect, while in the AK model, it has both growth and level effects.